We have seen a clear winner many times when looking at the Samsung Galaxy S4 vs. iPhone 5, although these previous comparisons were taking specs and features into account by comparing hands-on reviews. The results look a little different when comparing the sales of each smartphone. Clear winner in the UK — just two days ago we noticed the Samsung Galaxy S4 has been trailing the Apple iPhone 5 in the UK, which was proven within a sales report from uSwitch, and our readers gave their opinions as to why this result took place. One Phones Review reader commented “Not everyone wants a phone as big as the Galaxy S4 and that is why they are losing out“. While this is true it certainly seems like a growing number of people see the benefits of bigger smartphones, which another reader supported this by stating, “A lot of people like the bigger phones that make an iPhone 5 look tiny and useless“. For some smartphone users it really comes down to the operating system, and Apple iOS users seem just as passionate as Android users. The Samsung Galaxy S4 mini has recently launched, and there’s certainly a desire for a smaller Android phone as seen in this comment “Bring out a Galaxy S4 with the same specs but sized like an iPhone 5 and Samsung will blow Apple out of the water“. Samsung Galaxy S4 vs. iPhone 5 is very different in US — today, we found a report by Canaccord Genuity that reveals the latest carrier retail sales and these paint a different picture when compared to the UK. When looking at May sales, the Samsung Galaxy S4 has apparently overtaken the iPhone 5 at T-Mobile, Sprint and Verizon retail locations. AT&T is the only carrier that still sees the iPhone 5 winning against the Samsung Galaxy S4, but these figures might not be all they seem. US carrier retail sales don’t include Apple Stores – we saw an update in the past few hours that clarifies a few things in regard to the Samsung Galaxy S4 vs. iPhone 5 in the US. The NYT received confirmation from Walkley that the initial figures didn’t include sales data from Apple Stores, which is apparently where a massive portion of iPhone 5 sales took place, so with this in-mind things could be very different. 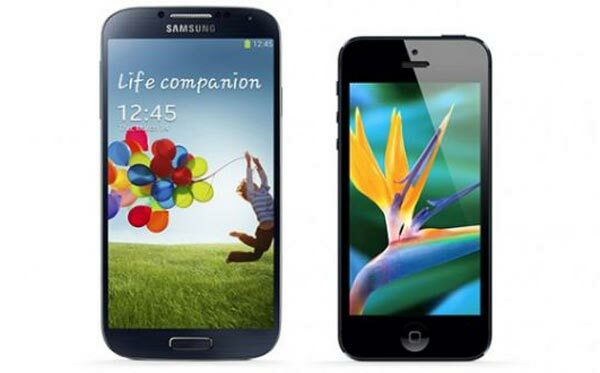 What smartphone best suits your needs, Samsung Galaxy S4 or iPhone 5? While it is clear the UK sales reveal the iPhone 5 as the winner, it seems the report for US smartphone sales isn’t so clear considering the lack of Apple Store data. Share a comment with your thoughts on the above article, and with your preference between iPhone 5 and Samsung Galaxy S4.